This is how the garden of the Museum of Impressionisms Giverny looks like in April. Small chambers of monochromatic beds are hidden behind tall hedges. Each one has a different atmosphere, creating a surprising effect for visitors who stroll along the central alley. Tulips are a must in spring, of course. But they need to be planted together with smaller flowers at their feet for a greater impact. Several varieties are suitable to cover the bare ground. Pansies exist in so many colors that it is possible to create infinite harmonies. Daisies are also a simple solution. Their pink gives a fresh look to the flower bed. But if you are as lazy as I am, you will certainly prefer forget-me-nots. They reseed on their own and offer a very tender and poetic cloud of tiny flowers for weeks. They are generally blue, but can also be found in pink or white. 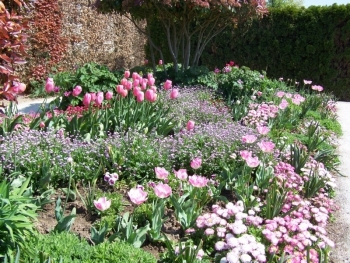 In Monet’s garden they are widely used: blue forget-me-nots with pink tulips, white ones with white tulips or pink with pink tulips for a ton sur ton harmony. Here in the Museum’s garden they are planted in a wave towered by a bunch of tulips: this way they give rhythm to the border.